Our range of products include hardox pipes, hardox 400 equivalent plate, hardox 450 plates, hardox plates, hardox cut plates and hardox 400 plates. 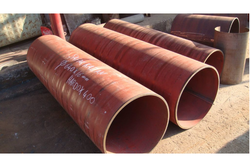 We at leomet manufacture quality wear pipes from wear plates. We manufacture wear pipes from abrex 400, abrex 500, abrex 400lt, abrex 500lt, hardox 400, hardox 500, quard 400, quard 500, dillidur 400, dilludur 500, 400bhn, 500bhn. Abrex 450, hardox 450. We offer all range of hardox 400 equivalent plates. We have more then 300MT of stock of Hardox 400 equivalent plate like Abrex 400, Abrex 500, Swebor 400, Swebor 500, Sumihard 400, Sumihard 500, Quard 400, Quard 500, Raex 400, Raex 500. Hardox 450 is an abrasion resistant plate with a hardness of 450 HBW, intended for applications where demands are imposed on abrasion resistance in combination with good cold bending properties. Hardox 450 offers very good weld ability. Hardox 450 has obtained its mechanical properties by quenching and when necessary by means of and Fabrication subsequent tempering. The properties of the delivery condition can not be retained after exposure to service or preheating\ temperatures in excess of 250oC (480o F). Width 1250mm / 1500mm / 2000mm. 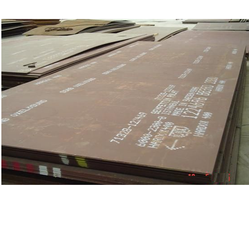 Hardox 400: Leomet Alloys Inc is one of the leading importer & supplier of Hardox 400 plates in India. Hardox 400 Plates are been tested in extremely demanding conditions requiring high strength and excellent abrasion resistance. 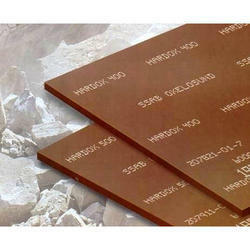 Hardox 400 (hardness 380-420 HBW) is a hardened steel particularly suited for long-term use in abrasive environments with high surface pressure. Hardox 400 is manufactured by SSAB Sweden on of the leader in wear plate manufacturer in entire world. They are know for the quality of the wear plate. Leomet Alloys Inc is highly acclaimed in offering a wide range of Hardox Plates. 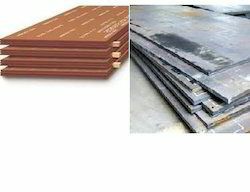 These Hardox plates are offered as per the industry set quality standards. Our range of Hardox plate is well known in the industry for its durability, performance and abrasion-resistance. This range is specifically used to increase the wear life. We offer this range in 400, 450, 500 grades, as per the specific requirements of our clients. We offer all hardox plates in cut parts and cut pcs also. 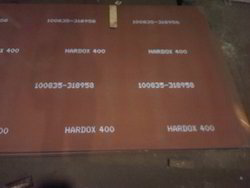 We can offer the hardox plate as per your specific requirement or required size. Hardox 400 is an abrasion resistant plate with a hardness of 400 HBW, intended for applications where demands are imposed on abrasion resistance in combination with good cold bending properties. Hardox 400 offers very good weld ability. Hardox 400 has obtained its mechanical properties by quenching and when necessary by means of and Fabrication subsequent tempering. The properties of the delivery condition of Hardox 400 plates can not be retained after exposure to service or preheating\ temperatures in excess of 250oC (480o F). Hardox 400 plates Appropriate health and safety precautions must be taken when welding, cutting, grinding or otherwise working on the product. Grinding, especially of primer coated plates, may produce dust with high particle concentration. Crushers, severs, feeders, measuring pockets, skips, cutting edges, conveyors, buckets, knives, gears, sprockets, dump trucks, loaders, industrial trucks, lorries, bulldozers, excavators, slurry pipe systems, screw conveyors, presses etc. Hardox 500 has obtained its mechanical properties by quenching and when necessary by means of and Fabrication subsequent tempering. The properties of the delivery condition can not be retained after exposure to service or preheating\ temperatures in excess of 250oC (480o F). Hardox 500 is not intended for further heat treatment For information concerning welding and fabrication please Appropriate health and saftey precautions must be taken when welding, cutting, grinding or otherwise working on the product. 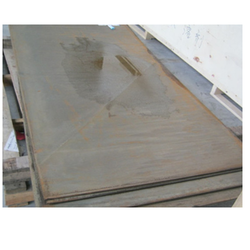 Grinding, especially of primer coated plates, may produce dust with high particle concentration. You can count on the experience of local Hardox Wearparts teams when producing parts from Hardox wear plate. Based on your drawings and instructions, expert and certified craftsmen ensure that Hardox wear resistant steel is bent, drilled, cut, welded or milled according to the highest standards. It is your guarantee for excellent results. Industries around the world depend on Hardox Wearparts to keep their operations running smoothly, without costly disturbances or downtime. Wear parts made of Hardox maximizes the wear performance of your products and machines. Depending on the situation, Hardox can increase service life dramatically. Two to three times is standard – even ten times or more has been reported compared with regular steel. In order to stay up-to-date with the latest technical routines, methods and processes, the people at Hardox Wearparts have access to continual support and training by Hardox engineers at SSAB. By optimizing the service lifetime of your parts and assisting in anticipating and planning repairs, Hardox Wearparts experts can help you evolve your repair strategy from reactive to pro-active. SSAB now sells Raex® — the high-strength, wear-resistant steel with good hardness and impact toughness — through SSAB’s Certified Partner network. Raex helps extend the lifespan of machinery, decrease wear in structural components and save costs. It also enables innovative design and lightweight products that improve energy efficiency.Raex is a high-strength, wear-resistant steel with favorable hardness and impact toughness. It can help extend the lifespan of machinery, decrease wear in structural components and save costs. It also enables innovative design and lightweight products improving energy efficiency.Applications include buckets and containers, cutting edges for earth moving machines, wearing parts for mining machines, wearing parts for concrete mixing plants and wood processing machines, platform structures, and feeders and funnels. SSAB now sells Raex® — the high-strength, wear-resistant steel with good hardness and impact toughness — through SSAB’s Certified Partner network. Raex helps extend the lifespan of machinery, decrease wear in structural components and save costs. Italso enables innovative design and lightweight products that improve energy efficiency.Raex is a high-strength, wear-resistant steel with favorable hardness and impact toughness. It can help extend the lifespan of machinery, decrease wear in structural components and save costs. It also enables innovative design and lightweight products improving energy efficiency.Applications include buckets and containers, cutting edges for earth moving machines, wearing parts for mining machines, wearing parts for concrete mixing plants and wood processing machines, platform structures, and feeders and funnels. Dimension Range Raex 400 sheet is available in thicknesses of 2 to 8 mm and Raex 400 plate in thicknesses of 6 to 80 mm. Maximum width is depending on thickness. More detailed information on dimension is provided .